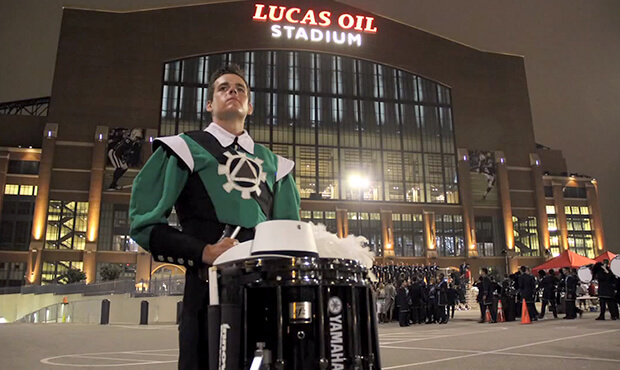 Connor Powell outside Lucas Oil Stadium during the 2013 DCI World Championships in Indianapolis. It's the kind of call that nobody ever wants to get—much less after embarking on a three-month journey across the United States performing as part of the Drum Corps International Tour. But that's what happened last May when first-year Cavaliers snare drummer Connor Powell got a call from home telling him that his 52-year-old mother, Ann, had suffered an unexpected stroke. Powell had recently left home in Virginia to join the Cavaliers' drum line for practice before the entire corps assembled for its spring training rehearsals in suburban Chicago. A few days after joining his fellow drummers, he got an unexpected call from his mother's boyfriend who said that he and his mom were on the way to the hospital suspecting she might be having a stroke. "I had been on the phone with her not 30 minutes earlier and was just in disbelief," Powell said. "Things looked good after the first night in the hospital for her, but by Saturday the swelling in her brain hadn't gone down," Powell explained. "The doctors decided that they needed to do emergency brain surgery to remove part of her skull so the swelling brain would have more room." After spending the previous two summers first as a member of the Jersey Surf and then Spirit of Atlanta, Powell's acceptance into the Cavaliers for their 2013 summer season was an opportunity he had always dreamed of. While feeling an immense obligation to be at home to take care of his mom and family, Powell also knew that as a 21-year-old member of the corps, this would be his final year of marching eligibility. For the short term, Powell recognized that he had to be with his mom and left the corps to fly back home to Richmond with the intention of returning to the corps if and when her condition improved. The situation at home settled down, and a week and a half later he made his return to the Cavaliers. Even with two years of previous drum corps experience under his belt, re-joining a new corps with still unfamiliar members and a new instructional staff proved to be a challenge. "Returning to spring training was basically like learning how to walk again," Powell said. "I got back and everyone had already learned the drill formations to the opener and all of the rehearsal protocol. I was so far behind and catching up. At some points it definitely seemed impossible." 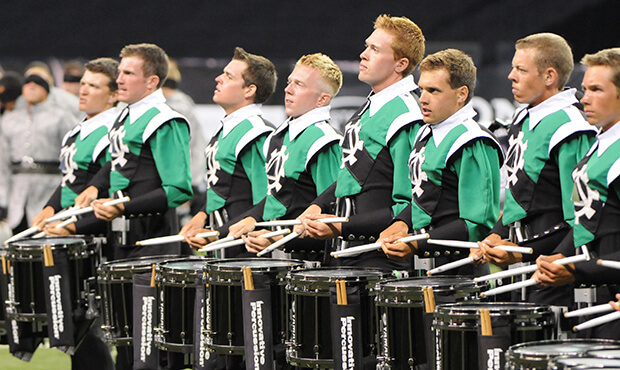 Powell (third from left) performs with the Cavaliers during the 2013 DCI World Championships in Indianapolis. Charging ahead, Powell spent time on and off the rehearsal field playing catch-up and working to acclimate and assimilate himself into his new surroundings, which he says wouldn't have been possible without an incredible amount of support from his fellow corps members and instructional and support staff. "People knew what happened and everyone always asked how I was doing and how my mother was doing," he says. "I already felt like I was a part of this huge family, and I didn't even know half of their names yet." As the corps continued to travel during the summer months, Powell checked in on his mom on an almost daily basis, but he was disappointed that she'd be unable to attend any of the corps' performances. Before the stroke, Ann planned to spend a week traveling with the corps as a volunteer. "I knew she was really looking forward to meeting everyone and seeing how the drum corps operates," Powell said. Coming into the week of the DCI World Championships in Indianapolis, Powell decided that if his mom couldn't spend time with the drum corps, he'd work to bring the corps to her. "Since she couldn't be there, I felt like we could somehow try to show her what a day was like and introduce her to some of the guys," he said. Working with the Cavaliers' director of communications Chris Lugo, Powell came up with the idea to create a video that he could share with his mom soon after he returned from his summer tour. With the help of corps videographer Dan Mills, Powell chose the day of the 2013 DCI World Championship Prelims on August 8 to encapsulate his summer-long experience touring with the Cavaliers. In front of the camera, Powell talked to his mom to show her what a typical day was like with the corps. A number of his friends in the drum line happily agreed to mug for the camera to introduce themselves and share their experiences as well. Mills finished editing the day-in-the-life video at the beginning of September. As a senior at James Madison University in Virginia, Powell left school for the weekend to drive home to surprise his mom. "The look on her face was priceless the whole time we watched it," Powell said. "She loved it, and we cried throughout. She shows the video to every single person that comes and visits her. One day I asked her why she did that, and her response to me was, 'Because it shows me how much you love me, and I love it.'" Coming up on a year since her stroke, Powell says that his mom has made a "stellar" recovery considering that doctors told him it was a miracle she was alive based on the severity of the stroke she suffered. "Just because it was a miracle she's alive, it doesn't mean she will have a miracle recovery," Powell says. "But she continues to impress everyone with her progress daily. My family and I are truly grateful and blessed." 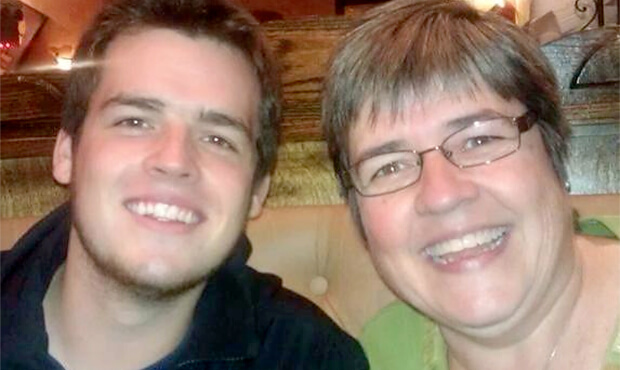 Connor Powell with his mother Ann. Finishing his first and final summer with the Cavaliers in 2013 coupled with all that his mother has been through, Powell says that many things in his life have been put into perspective. The importance of his family—both his immediate family and the extended family he's met through his drum corps experience—has become paramount. "People don't think something like a stroke will happen to them, but the honest truth is it can. Show the people you love how much you care about them as often as possible, because you never know when it may be the last time. "Drum corps isn't all about running around on the field playing an instrument or spinning a flag, it's about the people you share the experience with. Yes, everyone wants to be the best and perform at their highest, but that will still only be temporary … I will forever remember the people I met, the memories we created, the overwhelming support I received and continue to receive from that special group of people."